. (1391). پارامترهای چشمه زمین‌لرزه 25 مهرماه 1388 ری- تهران، با بزرگای گشتاوری 3/4. مجله ژئوفیزیک ایران, 6(3), 46-58.
. "پارامترهای چشمه زمین‌لرزه 25 مهرماه 1388 ری- تهران، با بزرگای گشتاوری 3/4". 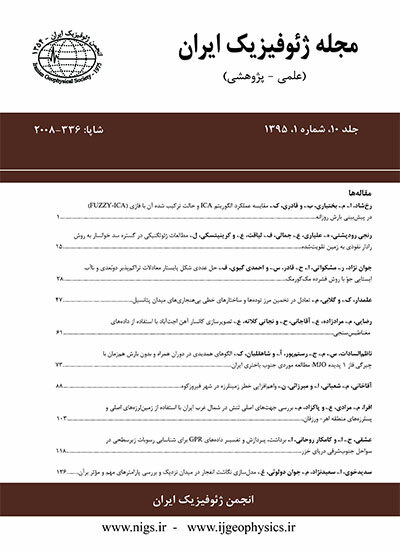 مجله ژئوفیزیک ایران, 6, 3, 1391, 46-58.
. (1391). 'پارامترهای چشمه زمین‌لرزه 25 مهرماه 1388 ری- تهران، با بزرگای گشتاوری 3/4', مجله ژئوفیزیک ایران, 6(3), pp. 46-58.
. پارامترهای چشمه زمین‌لرزه 25 مهرماه 1388 ری- تهران، با بزرگای گشتاوری 3/4. مجله ژئوفیزیک ایران, 1391; 6(3): 46-58. زمین‌لرزه 25 مهرماه 1388 با بزرگای گشتاوری 3/4 با ترکیب داده‌‌های 29 ایستگاه لرزه‌نگاری محلی و شتاب‌نگاری در منتهاالیه غربی گسل پارچین در جنوب شرق تهران با مختصات 57/35 درجه عرض جغرافیایی شمالی و 51/51 درجه طول جغرافیایی شرقی و عمق 2±15 کیلومتر تعیین محل شده است. سازوکار کانونی این زمین‌لرزه با استفاده از قطبش اولین رسید از نوع معکوس با مولفه کوچک امتدادلغز تعیین شده است. حل تانسور ممان این زمین‌لرزه به روش مدل‌سازی نگاشت‌های جابه‌جایی ثبت شده در شبکه لرزه‌نگاری ملی نوار پهن ایران نشان‌دهنده سازوکار معکوس در امتداد شمال غرب -جنوب شرق به موازات گسل پارچین است. عمق سنتروئید این زمین‌لرزه 2 ± 12 کیلومتر و گشتاور لرزه‌ای1015 × 1/3 نیوتن‌متر محاسبه شده است. سازوکار تعیین شده برای این زمین‌لرزه، شاهد دیگری بر غلبه مولفه سازوکار معکوس در لبه جنوبی البرز و تقویت نظریه تعدیل تغییر شکل در منطقه البرز با تقسیم لغزش روی گسل‌های امتدادلغز و معکوس است. Tehran, Iran’s capital with more than 10 million population is located in the southern foothills of the Alborz collision zone. The Alborz active mountain range consists of several sedimentary and volcanic layers, EW trending mountain belt 100-km wide and 600-km long, is bounded by Talesh Mountains to the West and by the Kopet Dagh Mountains to the East. 5±2 mm/yr shortening and 4±2 mm/yr left-lateral strike-slip motion in central Alborz implies a slip partitioning between strike-slip and reverse faults across Alborz. The city is bounded by active faults. Several of these faults have been mapped but their geometry at depth, their seismicity and kinematics are not precisely known. Historical earthquakes are associated with Mosha, Taleqan, Parchin and Garmsar faults, with the largest events on the Garmsar (Ms ~ 7.6) and Taleqan (Ms ~ 7.7) faults during the third andtenth centuries BC, respectively. Obtained information until now reveal that better understanding of the Alborz region needs more detailed studies in longer time intervals. Several questions about faults geometry, associated seismicity, their interactions and the mechanism of deformation in this region are remained unanswered. Considering the weak geological evidence of fault activity in some parts of Tehran, and rare calculated focal mechanisms for large earthquakes, moment tensor solution of small ones can help us with better understanding of fault behavior in this region. Combining the data recorded by 29 local seismic and accelerograph stations, October 17, 2009 Ray Earthquake, Mw 4.3, was located in the westernmost part of the Parchin fault in the south of Bibi Shahrbanoo Mountain, 35.57° latitude, 51.51° longitude and 15 km depth in south-east edge of Tehran mega city. Using first motion data, a reverse mechanism with a small component of the strike-slip motion was determined. Deviatoric moment tensor was inverted by using broadband data recorded by seven Iranian stations from National Seismic Network, INSN. We used ISOLA program (Sokos and Zahradnik, 2008) that is based on the multiple point-source representation and iterative deconvoloution method, similar to Kikuchi and Kanamori (1991) for teleseismic records, but here the full wavefield is considered, and Green functions are calculated by discrete wavenumber method of Bouchon (1981). Doing many tests, we selected the 0.06-0.095 Hz frequency range that resulted in the highest variance reduction. Besides, we examined the centroid-depth range between 5 and 23 km to find the best correlation. To calculate Green functions, we used the velocity model by Abbasi et. al. (2010) for the Southern flank of Alborz. Inversion with different data subsets verified the stability of the solution. The deviatoric moment tensor inversion for this earthquake by waveform modeling shows almost a pure reverse mechanism, 97% DC component, in northwest-southeast direction along Parchin fault and a centroid depth of 11 km. It is another evidence of dominant reverse mechanism in the southern edge of the Alborz region that implies the accommodation of deformation in Alborz by the slip partitioning. The estimated seismic moment for this earthquake was 3.096e15 Newton meter resulting in a 4.3 moment magnitude using Kanamori (1977) relation. بربریان، م.، قریشی، م.، ارژنگ روش، ب. و مهاجر اشجعی. ا.، 1371، پژوهش و بررسی ژرف نوزمین‌ساخت، لرزه‌زمین‌ساخت و خطر زمین‌لرزه-گسلش در گستره تهران و پیرامون: سازمان زمین‌شناسی کشور، گزارش شماره 56. یمینی‌فرد، ف.، مرادی، ع.، حسینی، م.، و نوروزی، م.، 1388، مطالعه لرزه خیزی تهران بزرگ و مجاورت آن با استفاده از داده‌‌های ثبت شده در شبکه لرزه‌نگاری تهران: فصلنامه علمی–پژوهشی علوم زمین، 73، 133-138. Abbassi, A., Nasrabadi, A., Tatar, M., Yaminifard, F., Abbassi, M. R., Hatzfeld, D., and Priestley, K., 2010, Crustal velocity structure in the southern edge of the Central Alborz (Iran): Journal of Geodynamics, 49, 68-78. Abbasi, M. R., and Shabanian Boroujeni, E., 2005, Determination of stress state and direction by inversion of fault-slip data in the southern of flank of Central Alborz: Geosciences, 12, 2-17. Alavi, M., 1996, Tectonostratigraphic synthesis and structural style of the Alborz mountain system in northern Iran: Journal of Geodynamics, 21, 1-33. Allen, M. B., Ghassemi, M. R., Sharabi, M., and Qoraishi., M., 2003, Accommodation of late Cenozoic oblique shortening in the Alborz range, northern Iran: J. Struct. Geol., 25, 659-672. Ambraseys, N. N., and Melville, C. P., 1982, A History of Persian Earthquakes. Cambridge Earth Science Series: Cambridge University Press, London, 212. Ashtari, M., Hatzfeld, D., and Kamalian, N., 2005, Microseismicity in the region of Tehran: Tectonophysics, 395, 193-208. Berberian, M., 1981, Active faulting and tectonics of Iran, in H. K. Gupta, F. M. D., ed., Zagros-Hindu Kush-Himalaya Geodynamic Evolution: Washington D. C., American Geophysical Union, 33-69. Berberian, M., and Yeats, R. S., 1999, Patterns of historical earthquake rupture in the Iranian plateau: Bull. Seis. Soc. Am., 89, 120-139. Bouchon, M., 1981, A simple method to calculate Green's functions for elastic layered media: Bull. Seis. Soc. Am., 71(4), 959-971. Brunet, M. F., Korotaev, M. V., Ershov, A., and Nikishin, A. M., 2003, The south Caspian basin: a review of its evolution from subsidence modeling: Sediment. Geol., 156, 119-148. Farahani, J. V., and Zaré, M., 2011, The southeastern Tehran Earthquake of 17 October 2009 (Mw=4.0): Seismological Research Letters, 82(3), 404-412. Hamzehloo, H., Sinaeian, F., Mahood, M., Mirzaei Alavijeh, H., and Farzanegan, E., 2009, Determination of causative fault parameters for the October 17, 2009, Ray-Tehran earthquake, using near field SH-wave data: Seismology and Earthquake Engineering, 11, 121-131. Hutton, L. K., and Boore, D., 1987, The Ml scale in southern California: Bull. Seis. Soc. Am., 77, 2074-2094. Jackson, J., Priestley, K., Allen, M., and Berberian, M., 2002, Active tectonics of the South Caspian Basin: Geophys. J. Int. 148, 214–245. Kanamori, H., 1977, The energy release in great earthquakes: J. Geophys. Res., 82, 1981-1987. Kikuchi, M., and Kanamori, H., 1991, Inversion of complex body waves-III: Bull. Seis. Soc. Am., 81, 2335-2350. Lienert, B. R., Berg, E., and Frazer, L. N., 1986, Hypocenter: An earthquake location method using centered, scaled, and adaptively least squares: Bull. Seis. Soc. Am., 76, 771-783. Motaghi, A. A., Rezapour, M. and Yaminifard, F., 2010, Double-difference relocation of earthquake hypocenters along the southern flank of the Central Alborz: Iran: Bull. Seis. Soc. Am., 100, 2014-2023. Ritz. J. F., Balescu, S., Soleymani, S., Abbasi, M., Nazari, H., Feghhi, K., Shabanian, E., Tabbassi, H., Farbod, Y., Lamothe, M., Michelot, J. L., Massault, M., Chéry, J., and Vernant, P., 2003, Determining the long-term slip rate along the Mosha fault, Central alborz, Iran, implications in terms of seismic Activity: S. E. E. 4 meeting, Tehran, 12-14 May. Ritz, J.F., Nazari, H., Ghassemi, A., Salamati, R., Shafei, A., Soleymani, S., and Vernant, P., 2006, Active transtension inside central Alborz: A new insight into northern Iran-southern Caspian geodynamics: Geology, 34, 477-480. Sengor, A. M. C., Altiner, D., Cin, A., Ustaomer, T., and Hsu, K. J., 1988, Origin and assembly of the Tehyside orogenic collage at the expense of Gondwana Land. In: Audley-Charles, M. G., Hallam, A. (Eds. ), Gondwana and Thetys. : Journal of the Geological Society, London, Spec. Publ., 37, 119-181. Snoke, J. A., Munsey, J. W., Teague, A. G., and Bollinger, G. A., 1984, A program for focal mechanism determination by combined use of polarity and SV-P amplitude ratio data: Earthquake notes, 55, 15. Sokos, E., and Zahradnik, J., 2008, ISOLA a Fortran code and a Matlab GUI to perform multiple-point source inversion of seismic data: Computers and Geoseiences, 34, 967-977. Tatar, M., Jackson, J., Hatzfeld, D., and Bergman, E., 2007, The 2004 May Baladeh earthquake (Mw 6.2) in the Alborz Iran: overthrusting the South Caspian Basin margin, partitioning of oblique convergence and the seismic hazard of Tehran: Geophys. J. Int., 170, 249-261. Tchalenko, J. S., Berberian, M., Iranmanesh, H., Bailly, M., and Arsovsky, M. ,1974,. Tectonic framework of the Tehran region: Geol. Surv. Iran, Rept. 29. Vernant, P. Nilforoushan, F. Hatzfeld, D. Abbassi, M. Vigny, C. Masson, F., Nankali, H., Martinod, J. Ashtiani, A. Bayer, R. Tavakoli, F., and Chéry, J., 2004, Contemporary crustal deformation and plate kinematics in Middle East constrained by GPS measurements in Iran and northern Oman: Geophys. J. Int., 157, 381-398.